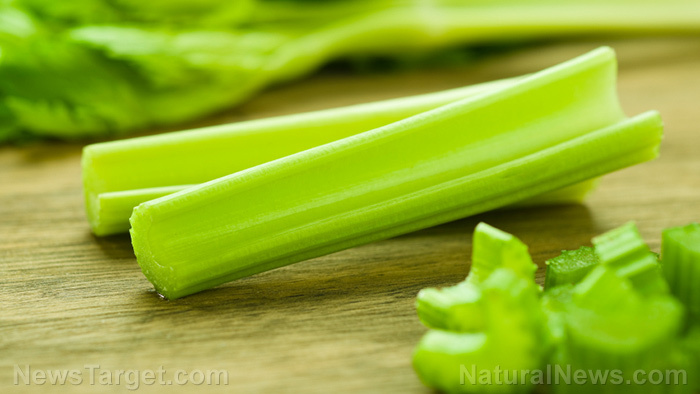 (Natural News) Celery may be a simple vegetable, but it is actually one of the most nutritious foods you could ever add to your diet. Its benefits have been known since ancient times. But what makes it nutritious? Researchers from Kurdistan University of Medical Sciences and Ahvaz Jundishapur University of Medical Sciences in Iran conducted a systematic review of the phenolic and antioxidant compounds of celery to find out. In the study, which was published in the Journal of Evidence-Based Integrative Medicine, the researchers gathered a total of 980 articles on the leaves and seeds of celery published from 1997 to 2015. However, only nine of the collected articles met the inclusion criteria and were considered in the review. Based on the findings of the review, celery contains phenolic and other antioxidant compounds, such as caffeic acid, p-coumaric acid, ferulic acid, apigenin, luteolin, tannin, saponin, and kaempferol that get rid of free radicals and have a healing effect on the body. Celery helps fight inflammation: Celery contains apigenin, which, according to a study published in the journal Molecular Nutrition and Food Research, can reduce inflammation and restore immune balance. This particular molecule is also being studied for its anti-cancer properties. Celery may lower blood pressure: An animal study on mice found that celery seeds can help regulate blood pressure. The findings indicate that celery may have the same effect on humans. Celery helps reduce hyperlipidemia: Hyperlipidemia is a condition that occurs when there is an increase in fatty molecules in the blood. This increases the long-term risk of heart disease and stroke. Research has shown that celery extract reduced the amount of bad cholesterol in the blood of mice that consumed a high-fat diet. Celery supports neurogenesis: The apigenin content of celery is also thought to promote neurogenesis or the growth and development of nerve cells. Apigenin also improves learning and memory. Celery seeds have also been used to treat arthritis and gout, muscle spasms, high blood pressure, colds and flu, and water retention. In addition to antioxidants, celery is also rich in vitamins A, C, and K, folate, potassium, and dietary fiber. Celery is most commonly consumed raw because of its crunchy stalks. However, it can also be eaten cooked, but keep in mind that some of its nutrients are lost during cooking. According to a study in 2011, celery loses very little of its nutrients when steamed. The authors found that after steaming for 10 minutes, celery still had 83 to 99 percent of its antioxidants. When it was boiled and blanched for 10 minutes, celery lost about 38 to 41 percent of its antioxidants. Celery can be consumed raw with organic cheese and dips, be added to salads, or added to a peanut butter sandwich. It can also be added to soups and risottos for additional flavor. Its seeds can also be used in various dishes, such as soups and salad dressings for flavor. Read more news stories and studies on other healing foods like celery by going to SuperFoods.news.